Photo: Archeological site in lower Wild Horse Canyon. Eastern Mojave Vegetation Archeological site in lower Wild Horse Canyon. 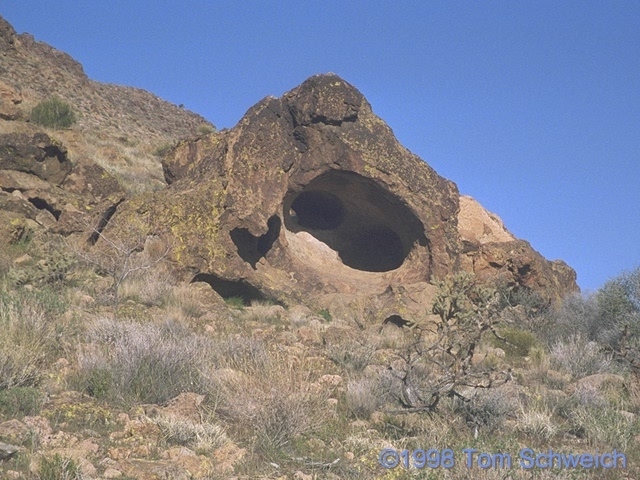 This archeological site in lower Wild Horse Canyon is formed inside a hollowed-out boulder of welded tuff. The hollow weathering features are called "tafoni." They are common in rocks of this type (fine-grained, acid composition) and this climate (arid to semi-arid). Both petroglyphs and pictographs are found here. Other photos about Archeology or SBr-291.